Do you know that fossil primates once roam North America? I didn’t know either so this discovery was a shock and a “d’oh” moment at the same time. Lingual view (side that touches the tongue) of Mescalerolemur horneri partial mandible. Scale bar equals 2 mm. Photo from Kirk & Williams (2011). Anywho … A fossil primate from the Eocene Epoch was discovered in Devil’s Graveyard badlands of West Texas by Anthropologists Christopher Kirk and Blythe Williams. 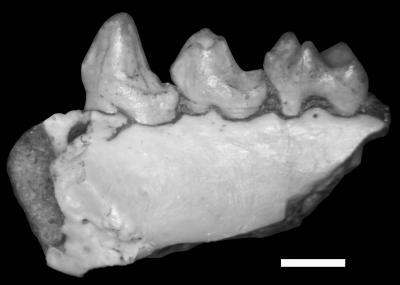 Named Mescalerolemur horneri, this new fossil primate lived about 43 million years ago is a member of the extinct group, adapiforms, that are found all over the Northern Hemisphere. Mescalerolemur looked like a modern-day greater dwarf lemur and weighs about 370 grams. Interestingly enough, Mescalerolemur are more closely related to Eurasian and African adapiforms than those from North America. Darwinius masillae, famously known as Aunt Ida, was a Eurasian adapiform. Another interesting fact to point out is that Mescalerolemur had unfused mandibular symphysis, similar to those of Strepsirrhines (lemurs, lorises and galagos). The authors posit that this is definitive evidence that adapiforms are more similar to Strepsirrhines than Haplorrhines (humans are Haplorrhines). Kirk &Williams (2011) published their findings on Journal of Evolution: New adapiform primate of Old World afﬁnities from the Devil’s Graveyard Formation of Texas (PDF). You can also read more about the discovery at EurekAlert: Anthropologist discovers new fossil primate species in West Texas. I suppose you have heard of Chris Beard’s book: The Hunt for the Dawn Monkey. Its a wonderfully written book about the route from our earliest primate ancestors to humans.